The Very Popular 11 6 Switch Rods Have Been Moved Into The Range Of Multi-Piece Rods By Having One More Piece Added To Them. Now You Can Fit Them In Your Fishing Bag And Do Not Need To Carry Extra Rod Containers On Your Next Fishing Trip. There Are Three Different Models, 6/7, 7/8 And 8/9 To Choose From. These Rods Are Configured With Hybrid Front Handles That Work Very Well Both As Single Hand And Double-Hand Grip. The Short Back Handle Gives A Good, Secure Hold For Double Hand Casting And At The Same Time, It Is Small Enough Not To Interfere With Your Single Hand Casting. The Lightweight Recoil Single Leg And Stripper Guides Help The Rod Action And Creates A Nice, Tip Light And Crisp Feeling In The Blank. These Rods Have A Relatively Stiff Tip That Can Handle Both Standard Scandi Heads And Heavier Skagit Type Heads Equally Well. They Are Powerful And You Will Be Surprised At The Length Of The Cast You Can Power Out With These Rods. The 6/7 Weight Rod Makes A Great Tool For Brown Trout Or Fishing For Smaller Grilse Sized Salmon. 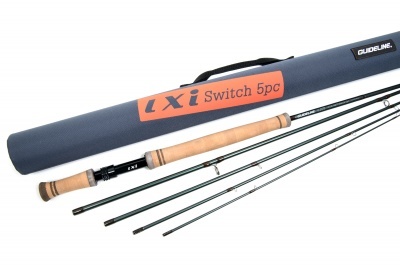 The 7/8 Weight Rod Is Very Useful As An Allrounder For Both Larger, Migratory Browns And For Sea Trout And Medium Sized Salmon. This Rod Loves A Compact 7/8 Line Set Up. The 8/9 Weight Rod Is Powerful And Handles Scandi Lines In Weights From 21 Grams And Performs Superb With A 24 Gram Scandi Or Multi Tip Switch Line. For Short Skagit Heads, Weights Up Around The 20-22 Gram/320-350 Grains Mark + Tip Are A Great Option.